If you were to construct a model of a human body out of materials from a hardware store, you might select pipe for bones, insulation for muscles and perhaps wallpaper for your skin. But what would you use for joints? The answer seems clear – hinges. But what do the body’s hinges do and why do they hurt so much? How can I treat joint pain at home? 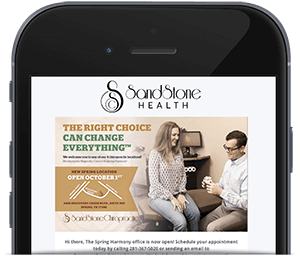 Request an appointment to discuss joint pain with Sandstone Health. A representative from Sandstone Health will be in touch to confirm your appointment time. Every time two or more of the 206 bones in your body come together, they form a joint. These joints have a variety of strength, range of motion and complexity ranging from the immovable joints in your skull to your knees, the most complex joints in your body where not two, but three bones come together. A series of ligaments, connective tissues that join one bone to another, and tendons, connective tissues that join a bone to a muscle, strengthen these joints and allow them to move. Often, fluid-filled sacs cushion the bones and keep them from rubbing against one another. There are 360 joints in the human body, each one is responsible for allowing us to run, walk, stand, sit, stretch, lift, jump, bend, and do every other activity we take for granted in our daily lives. Joint pain can be caused by a number of illnesses, injuries, and conditions. Some of the most common causes of joint pain are arthritis, bursitis, fibromyalgia, gout, sprain, strain, and tendonitis. Arthritis is not one disease, but a descriptive term for more than 100 diseases that affect the joints in the body. Common symptoms include stiffness, pain and a limited range of motion in the affected joint. Osteoarthritis, the most common type of arthritis often results in chronic pain and a lack of ability to do normal daily tasks like open jars, walk up stairs, or write with a pen or pencil. This happens when the cartilage, the cushioning surface on the ends of the bones, breaks down causing a bone to rub directly against another bone. More than 50 million adults and 300,000 children have arthritis in some form but don’t necessarily know it. While there is no known cure, protecting the cartilage in the body and keeping joints moving the way they should can prevent further deterioration. Small fluid-filled sacs called bursae work to cushion the bones in your joints as well as the surrounding muscles and tendons. When these sacs become inflamed, the condition is called bursitis. Most often, bursitis affects shoulders, hips, elbows, and knees, but you can experience it in your heels and the base of your big toe. Any joint that performs repetitive motion is at risk for developing bursitis. Typically, bursitis causes pain, stiffness, swelling, and redness in the joint and surrounding area and often flares up after it goes away. Fibromyalgia is not a disease, but rather a descriptive term for widespread, chronic pain in the muscles and joints on both sides of the body, above and below your waist. Infection, emotional trauma, and genetics may play a role in developing fibromyalgia, but the cause is unknown. Treatment often focuses on relieving the painful symptoms, sleep problems, or mental fog that often accompanies the condition. Gout is a type of inflammatory arthritis that flares up when you have high levels of uric acid in your bloodstream. Our bodies naturally produce uric acid when we metabolize red meat, alcohol or sugar, but our kidneys filter it out through our urine. When your body produces too much uric acid that cannot be readily removed from the bloodstream, it forms sharp crystals in your joints that causes severe pain, redness, swelling, and tenderness. A joint sprain happens when the ligaments (the tissues that connect one bone to another) are partially or completely torn. While ankle sprains are the most common type of sprain in the body, any movable joint can be sprained when it suddenly moves in a direction it is not intended to. Sprained joints are painful, they often swell, and left untreated leave the joint vulnerable to further injury. While many people use the terms “sprain” and “strain” interchangeably, the two conditions are actually different. While a sprain is the stretching and tearing of ligaments, a strain happens when tendons and muscles stretch or tear. Even though strains most often happen in the legs, feet, and back, they can happen anywhere a tendon connects a bone and a muscle. Like a sprain, a strain is painful and can result in swelling and tenderness. And like a sprain, if left untreated, a strain can leave the joint weak and vulnerable to injury later on. Tendinitis is one of the most common overuse injuries in the body. Repetitive, minor impact leads to inflammation in the tendon, the thick, fibrous tissue that connects your bone to your muscle. Tendinitis can happen at any time in any joint but is most common in arms, shoulders, knees, and hips. It is often painful with swelling and redness in the affected joint. Traditional treatment involves rest, ice and over-the-counter pain relievers, but these often do not address the underlying cause of most tendinitis – an incorrectly placed joint, poor posture, or weak muscles. In many cases, you can find relief from joint pain with a few, simple home remedies. The magnesium sulfate in Epsom salts is easily absorbed through the skin and naturally reduces inflammation. Meanwhile, the warm water relaxes tense muscles and eases aching joints. Adding 1/2 cup Epsom salts and enjoying a 15-minute soak is especially helpful if you are experiencing joint pain in more than one area of the body. The last thing you may want to do when your joints hurt is get moving. However, dynamic stretching like yoga, Pilates and tai chi, has been shown to lubricate joints and ease painful inflammation. Just remember to never stretch a cold muscle, warm up properly with a short walk before you begin, and cool down appropriately. If you struggle with arthritis or other chronic joint pain, one of the most effective ways to manage it is to maintain a healthy weight. For instance, for every pound you weigh, you put four pounds of pressure on your knees. Even if you are only 10 pounds overweight, that extra 40 pounds of pressure on each knee joint quickly contributes to the deterioration of the cartilage in your joints. Combining a healthy diet with exercise not only helps you lose any extra weight you are carrying, but it can also keep your joints lubricated. What you eat has a huge impact on how your joints feel. Eating a diet high in white breads and pastas, processed sugars, processed or pre-packaged foods, or foods that are high in trans fats can cause inflammation everywhere in your body, including in your joints. People that reduce or even eliminate these from their diets often find that their chronic joint pain begins to go away as the inflammation in their body subsides. Eating a whole food diet rich in vegetables, fruits, lean proteins, and some whole grains can fight inflammation and keep your joints limber. Never underestimate the power of massage. Anytime you experience joint pain, your body naturally compensates in order to protect the painful joint. If one knee hurts, you might develop a limp in order to minimize the pressure you put on the painful knee. If you have bursitis in a shoulder, you will hold your arm to minimize the movement that would cause pain. All of these compensatory adjustments we make naturally wreak havoc on the rest of our muscles and joints. Sure, your hip might hurt but if you are not careful, so will your knee and foot. Massage not only relaxes tense muscles that are protecting your joint, but it can also help relax the areas that may be compensating for the joint as well. Sudden pain or weakness in a joint. Inflammation that does not resolve with rest and ice. An injury to the joint. Pain that lasts for longer than two weeks or gets worse over time. Once you have made the phone call to a doctor, knowing what to expect from diagnosis and treatment can alleviate a lot of fears before your consultation. While every person is different, most doctors will begin their examination with a complete medical history as they try to pinpoint when your joint pain began and the type of pain you are experiencing (throbbing, aching, sharp and shooting, or dull). Next, doctors typically perform a physical examination, examining the affected area as well as other areas of your body that may be contributing to your pain. This physical exam often includes diagnostic tests such as x-ray, range of motion testing, diagnostic ultrasound, or other lab work to determine the type of joint pain you are experiencing. After a doctor has diagnosed the site, cause, and severity of your pain, they can begin to explore treatment options to help you find relief. While many people feel the worst, most joint pain does not require surgery. Even if surgery is indicated, many injuries can be healed over time with less invasive treatments. The best treatment for your joint pain will depend on where it is located and the severity of the injury. These cutting edge, drug-free joint pain treatments are among the most safe, effective and commonly used. Most people associate chiropractic care with the spine, not knees, feet, ankles, or hips. When you stop to think about it, chiropractic care is exclusively about realigning joints in the body to help them function properly. If the joints in the vertebrae are aligned, the nerves that emanate from the spine are able to communicate with the rest of the body undisturbed. As a result, people experience less pain not only in their backs but also throughout their body. Pulsed Electromagnetic Field Therapy (PEMF) sounds like something out of a sci-fi novel, but it is one of the most effective non-invasive treatment options for joint pain available. Every cell in your body, from your heart to your brain to your muscles runs on an electrical charge. As these electrical impulses diminish over time, it becomes more difficult for the cells to regenerate. As most of us know, cell death leads to illness, poor circulation, slow healing, and pain. PEMF supercharges the electrical impulses in your body’s cells by sending thousands of volts into your body in billionth of a second pulses. PEMF is painless, non-invasive and can be completed by simply laying down on a PEMF equipped table. In addition to faster healing, tissue regrowth, and bone strengthening, most people report sleeping better and feeling less stress after their session. Our bodies naturally produce a blood product called plasma that consists of concentrated platelets, red blood cells, and white blood cells. By concentrating this plasma and introducing it to your joints, PRP therapy isolates your body’s ability to heal itself and delivers it right where you need it. This minimally invasive process repairs joints without drugs or surgery. Stem cells are the basic building blocks of all tissue, organs, bones, and nerves in our bodies. These cells have the potential to become anything – new tissue, new bone, new organs, or new tendons and ligaments. All they need is the right signal for them to start growing. When these cells are injected into a damaged joint, they begin to form new tissue and help heal the damage safely and permanently. Regenerative therapies have been proven to regenerate cartilage, heal ligament and tendon tears and keep thousands of patients out of a surgeon’s office. This type of minimally invasive treatment has also been shown to help you return to activity up to 50 percent faster than surgery or other interventions. Whether you just injured yourself or you are babying an old joint injury, knowing when to treat it at home and when to call a professional is one of the biggest keys to achieving total healing and health. If you have been struggling for more than two weeks, or your pain is getting worse, not improving with rest or keeping you from doing the things you do, call Sandstone for a consultation.